The International Ozone Association is pleased to present the Call for Papers for its World Congress & Exhibition. This biennial event will be held 20-25 October 2019, in Nice, France, at the Hyatt Hotel, located at "Promenade des Anglais" on the sea front. We welcome your participation in this premier event on Ozone and Advanced Oxidation: Leading-edge science and technologies. We are seeking original work on a wide variety of topics. Abstracts and all required documents must be submitted electronically via the Congress website. We are inviting Organizations and Companies to support the Congress and to exhibit their technologies, products and services related to the Congress theme. 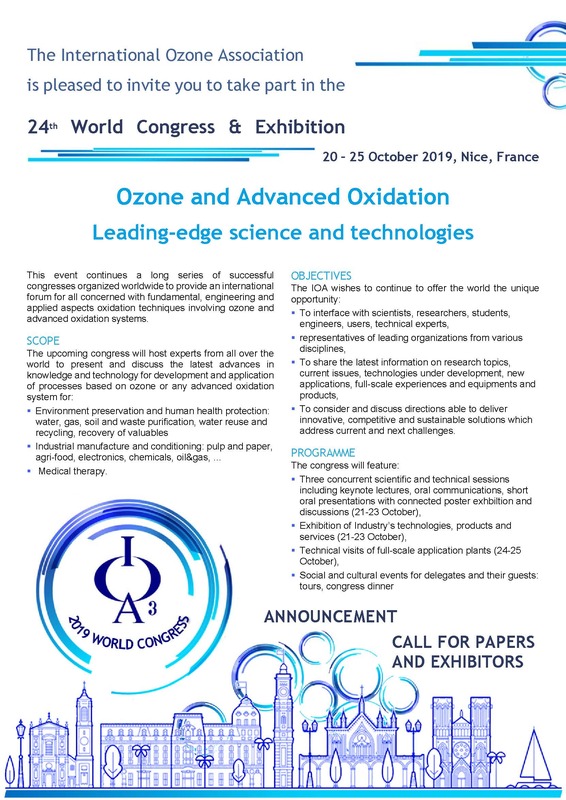 The Theme of the World Congress 2019 covers a wide range of topics on fundamentals, engineering and applied aspects of oxidation techniques involving ozone and advanced oxidation systems with the aim to highlight the key issues and the latest advances from scientific to operational disciplines. It reflects the IOA commitment to consider and discuss directions able to deliver innovative, competitive and sustainable solutions which address current and next challenges in the fields of environment preservation and human health protection, industrial manufacture and conditioning, medical therapy. Who Should Attend? For decades, IOA World Congresses bring together scientists, researchers, students, engineers, users, technical experts, consultants, manufacturers and suppliers of systems, representatives of leading organizations from various disciplines. Submission To be considered for placement in the program, you must submit an extended abstract by 13 May according to details provided at the submission page of the flyer and the Congress website. Prospective exhibitors are kindly asked to contact the Congress secretariat.